We are familiar with the term “recycling” as it relates to re-using household waste and items we no longer need. Recycling also takes place in nature as compounds are broken down and re-assembled into other compounds. Both energy and materials ﬂow through ecosystems. It would be impossible for life to continue without the continual replenishment of nutrients. The quantities of nutrients and energy available to ecosystems directly affect the populations of organisms, the metabolic rate at which they live and the structure of the ecosystem. The ﬂow of nutrients and energy through an ecosystem depends on a positive feedback loop: the greater the supply of nutrients, the more energy will be produced. As more energy ﬂows through a system, more nutrients are released for productivity. However, productivity cannot expand indefinitely. 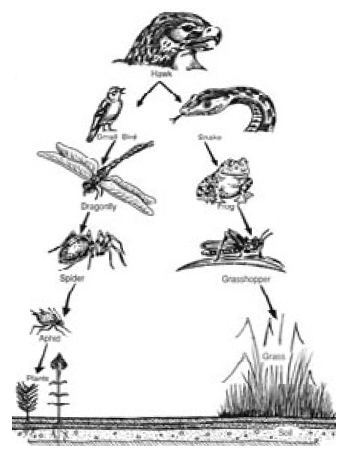 Figure 10 -An example of a food chain in a Nova Scotia woodlot. There is a point beyond which the requirement for nutrients and energy is so great that further growth is limited. The food chain on your woodlot starts with plants that absorb solar energy and use it to produce sugars. The plants either decay and are broken down by bacteria or fungi, or are consumed by herbivores (plant-eaters). The consumers are preyed upon by carnivores, which may in turn be eaten by other carnivores. 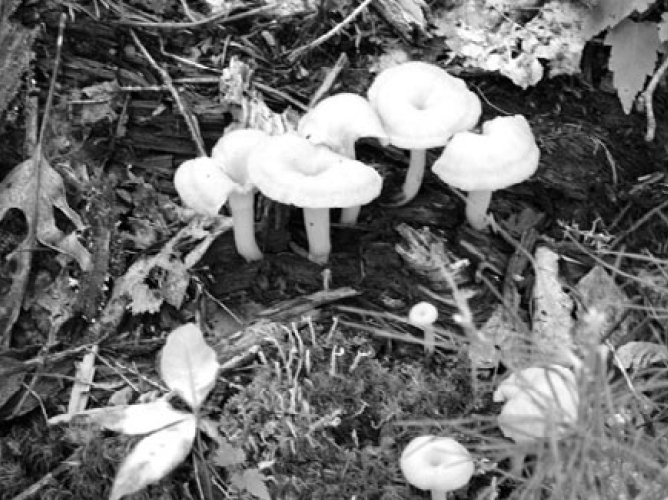 Nutrients are found everywhere on your woodlot. Trees and other vegetation store vast quantities of nutrients that are recycled into the soil when the leaves fall off in autumn, or when trees are blown down. When trees are harvested, the stumps, branches and leaves that are left behind decompose and the nutrients accumulate in the soil until they are used by other producers. Large quantities of nutrients are stored in forest soils, and in decaying woody material on the forest floor. While these nutrients may not be immediately available to other producers, decomposer organisms can release them. Many elements essential to living ecosystems are stored in the trees and other vegetation of your woodlot. These include nitrogen, phosphorus, potassium, calcium and magnesium. Hardwood trees contribute more nutrients to the environment than softwoods because their leaves and twigs break down more quickly. If you have a diverse mixture of hardwood and softwood trees on through the soil and are made available to plants your woodlot, nutrients are constantly being cycled and animals. Figure 11 - Nutrient flow in a forest ecosystem. A high proportion of living things is made up of water. Plants need water to make food and to move nutrients through their systems. Over three-quarters of most animals' body weight is water. Solar energy and rain are the driving forces of the water cycle. Precipitation is the primary means by which water in the atmosphere reaches the Earth, and solar energy causes water to be recycled from the oceans, rivers, streams and lakes. The warm, moist air rises and forms clouds of water vapor. Wind moves the clouds over the land where some of the water falls as snow or rain. Fog may also form, which can be important in maintaining moisture on or near the ground. Water is often intercepted before it reaches the ground. Trees and other vegetation absorb moisture through the leaves: hardwoods intercept precipitation during a light summer rain. In winter, softwoods intercept a higher proportion of precipitation than hardwoods. During growing season, water is taken up by plant roots and used to manufacture sugar in the leaves of the plant. By a process called evapotranspiration, plants gradually release water back into the air. This control mechanism allows plants to retain water when it is dry, and release it at other times. As plants take up water through their roots and move it to their leaves, some water is lost. This occurs when water leaks from the leaves as they open the pores in the leaves called stomata to receive carbon dioxide from the atmosphere. Once trees are saturated, excessive moisture will drip from their leaves, needles and branches, or run down the tree's stem. Water enters the soil through infiltration. The rate that it enters the soil depends on the topography of the site, vegetation cover and the soil's physical characteristics. Water fills pores in the soil through gravity and capillary action until the capacity of the soil is reached. By a process called percolation, water moves downwards through the soil until it reaches an impervious layer. It may collect here or move to springs and streams. 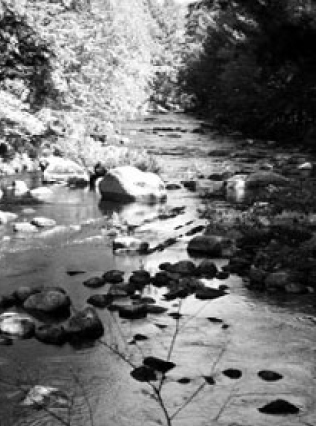 Figure 12 - Beaver meadows are important sources of water and nutrients to many species of wildlife. In some finely textured soils, water is held tightly to soil particles. These soils may appear saturated at nearly all times of the year. The ability of soils to hold water is called its field capacity. Soils with high clay content have a high field capacity, while sandy, well-drained soils have a low field capacity. Water that remains on the surface of the soil, in streams and rivers, or on the leaves of plants, returns to the atmosphere by evaporation. 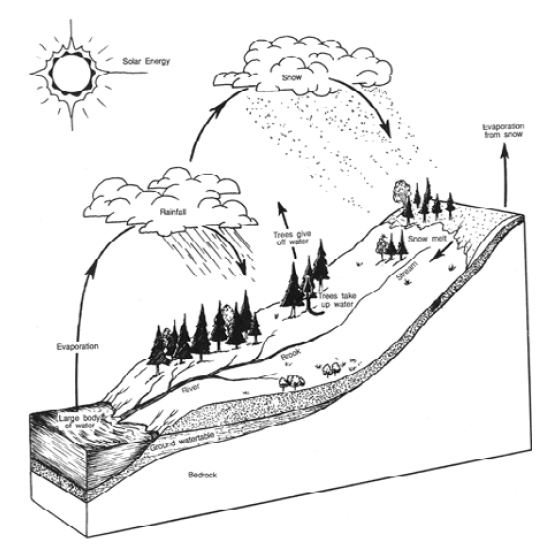 Figure 13 - The Water Cycle. All organic compounds contain carbon, which plays a vital role in the production of oxygen and sugars by plants, a process called photosynthesis. Carbon is found in both living and dead organisms, including fossils. During photosynthesis, plants absorb carbon dioxide from the atmosphere and use it to manufacture sugars and fats, and is stored as plant tissue. Herbivores, or plant-eating animals, convert the plant tissue to other forms of carbon-based compounds. Meat-eating Carnivores consume herbivores, and the carbon is re-digested and re-formed into other organic compounds. Respiration by plants and animals also return carbon dioxide to the atmosphere. Decomposing organisms release carbon dioxide as plant and animal wastes and tissues are broken down. In wet areas such as marshes and bogs, with little available oxygen to aid the decomposition process, organic carbon is broken down very slowly and may be stored as peat. Over many years, carbon can also be stored as coal, oil and natural gas. During the past century, an important source of carbon in the atmosphere has been the burning of fossil fuels, which releases long-held carbon in the form of carbon dioxide and methane. 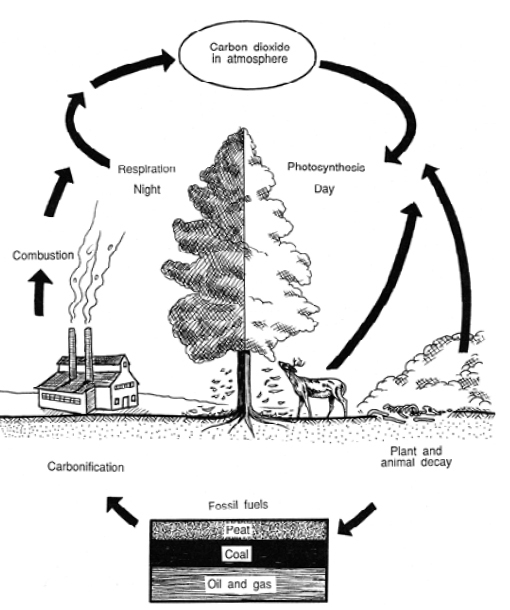 Figure 13a - The Carbon Cycle. The concentration of carbon in the atmosphere varies during the day. In early morning, as plants begin photosynthesis, the concentration of carbon dioxide drops sharply until the afternoon when plants slow their uptake of carbon dioxide as sunlight decreases. During winter months in temperate climates, plants assimilate less carbon dioxide than in summer months, resulting in higher carbon dioxide levels in the atmosphere during this time. Forests store carbon longer than other ecosystems. During forest fires or when wood is burned for fuel or land-clearing, carbon is released quickly. When logging slash decomposes, carbon is released slowly. The atmosphere is composed of 79 percent nitrogen and is an essential component of protein, making it fundamental to all living things. In its gaseous state, however, nitrogen cannot be used by most forms of life. It must be converted to other compounds in order to be made available to plants and animals. Fixation: There are two ways in which nitrogen can be made available to living things: by conversion to nitrates through high-energy fixation, or by conversion to ammonia through biological processes. High-energy fixation can be achieved by lightning in the atmosphere, and nitrates are carried to Earth by precipitation. Figure 13a - Alders "fix" nitrogen and make it available to other plants. Over 90 percent of fixation is carried out by bacteria working in symbiosis with plants. During fixation, gaseous nitrogen is converted to ammonia in chemical reactions, occurring near the roots of the plants, which may be legumes (pea family), or non-legumes with nodule-bearing roots (speckled alder is a good example). Ammonification: Dead animal and plant tissues are broken down by decomposing organisms in soil and water. The amino acids that are generated by this process are further decomposed by bacteria to yield carbon dioxide, water and ammonia. Soluble in water, the ammonia is available for uptake by plant roots. Nitrification: In this process, ammonia is converted to nitrates and nitrites by micro-organisms. However, nitrates in larger quantities can be harmful to the environment, and its ready solubility in water can move the nitrates away from plant roots before they are absorbed. During denitrification, nitrates in the presence of fungi and some bacteria are broken down into gaseous nitrogen, which is released into the atmosphere for the process to begin again. Nitrogen in the form of ammonia or nitrates is taken up by plants and converted to amino acids when plants are eaten by herbivores. As plant and animal tissues decay, they are broken down by bacteria and fungi to form ammonia. The ammonia can either be taken up by plants to be converted into amino acids, or undergo denitrification to be released as gaseous nitrogen. Nitrates resulting from nitrification can be taken up by plants, trapped in decomposing organic material, stored by microbes, or leached away by water to aquatic marine environments, where the cycle will continue. Without nitrogen, many forms of life would not exist. Although the atmosphere contains 79 percent nitrogen, in its gaseous form it cannot be used by plants and animals. Specialized bacteria are able to "fix" nitrogen, combining nitrogen with hydrogen to form ammonia. Because ammonia is soluble in water, plants can take it up and use it for growth and other processes. 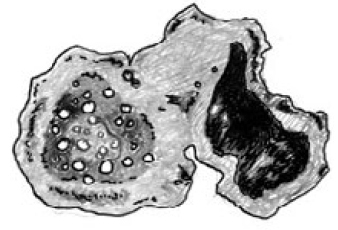 Figure 15 - A cross-section of a root with a nodule containing nitrogen-fixing bacteria. 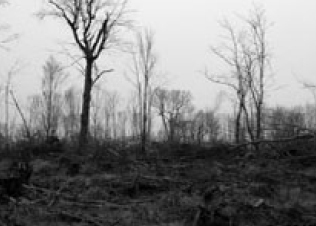 Large amounts of nitrogen are lost when forests are harvested and woody material is removed from the site. In the absence of nitrates, soil nutrition is depleted until new regeneration is established on the forest floor. Only about 1 to 3 percent of soil organic matter is nitrogen, but this small amount is used over and over again. 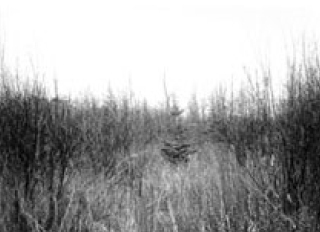 Figure 16 - Clearcutting removes significant amounts of useable nitrogen from forest soils. Nitrogen can be released into the environment in harmful forms such as nitrogen oxides. Common in automobile exhaust and industrial emissions, nitrogen oxides are broken down by ultraviolet light into nitrogen monoxide and atomic oxygen. Atomic oxygen reacts with molecular oxygen to form ozone, which multiplies the harmful effects of many other types of air pollutants. Sulfur occurs naturally in rocks, sediments and in the Earth's atmosphere. It enters the atmosphere through the decomposition of plant and animal tissue and by volcanic eruptions. Sulfur is present in the atmosphere in the form of hydrogen sulfide and sulfur dioxide. Precipitation carries the sulfur back to Earth, and its reaction with water results in the formation of sulfuric acid. In this soluble state, sulfur is taken up by plants where it plays a vital role in photosynthesis and in building protein. Sulfur is returned to the environment as plants (or herbivores that have consumed the plants) decay or excrete sulfur into the soil or water. Sulfur accumulates at the bottoms of ponds and oceans, where bacterial activity releases it as hydrogen sulfide or sulfate. You've likely noticed the smell of sulfur near swamps and salt marshes, where sulfuric acid persists in the mud. 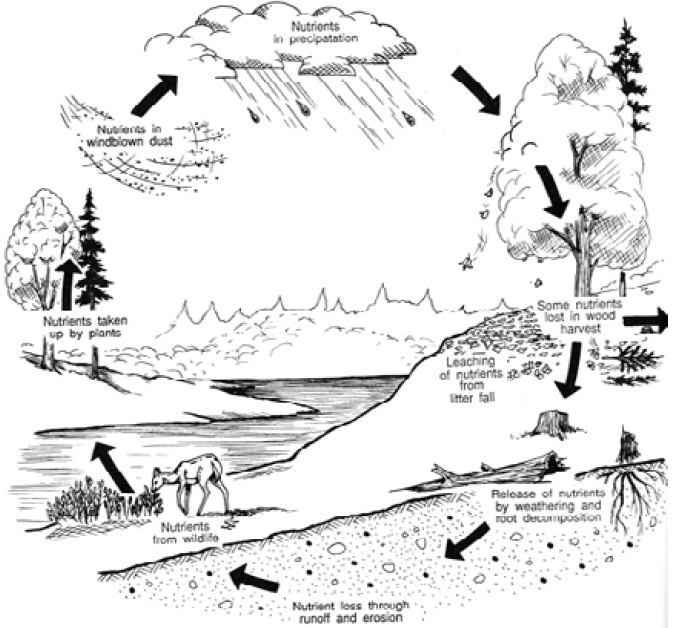 Figure 17 - High sulfur content in the atmosphere causes acid rain and acidic lakes and streams. Humans release sulfuric acid and sulfur dioxide into the atmosphere by burning fossil fuels. Over time, sulfuric acid accumulates in soils and water and can harm plants, fish and other organisms. 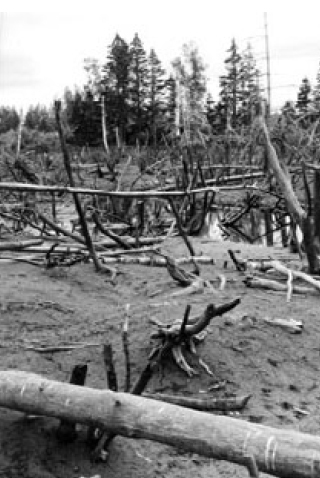 Acid rain, caused by high sulfur emissions, has been a severe problem in forests and lakes of southwestern Nova Scotia during the past few decades. This has been primarily caused by the burning of fossil fuels. With improved technologies and reductions in hydrogen sulfide emissions, much of this area of the province has begun to recover. Living things require phosphorus for the formation of cell membranes, the construction of DNA, and in the structure of bones and teeth. While sulfur is commonly found in the atmosphere, phosphorus is not. Phosphorus follows only terrestrial or aquatic cycles, which limits the ways in which it can be distributed. Weathering of phosphate deposits in rock is the most common source of phosphorus in the environment. Phosphorus finds its way through ecosystems by uptake and release by plants, ingestion and excretion by animals, and by decay. It accumulates in soils and is stored in sedimentary rock until weathering releases it. Phosphorus is a major component of agricultural fertilizers, and concentrations in water results in algae "blooms" as organisms react to the phosphorus-rich environment. Plankton are microcopic organisms that life suspended in the water. Zooplankton are animal plankton that ingest the phosphorus and excrete much of it as inorganic phosphates. These wastes are taken up by phytoplankton (plant plankton) and bacteria, which are consumed by other organisms. Decaying plants and animals settle on the bottom, and phosphorus is recycled as sediments are exposed and weathered.